I never expected this so I am ecstatic. On top, it was against such a strong team as well. However, I don’t think I did it by myself. My teammates gave me advice for every game and thanks to that, I was able to win. Losira scored four kills as the first player. Were you planned as the last player for TSL? I was waiting to be sent out on my coach’s instructions without knowing when. I think it came down to me after using up all our cards against Losira. How did it feel to be the ace when your team had its back against the wall? It was very hopeless. However, the match was not over yet and I couldn’t accept a 0:5 defeat. So, I listened to my teammates’ advice and played as well as I could. Did you go in expecting a reverse all kill? Honestly, no. I just promised myself that I would not lose helplessly. Last season, I lost rather badly in Round 1 so I worked even harder this time. Even against Losira, I wasn’t quite warmed up yet and played badly. I thought I had lost but once I took that game, I expected to take around two more. Then I kept winning and my confidence grew. When did you become sure of your all kill? Never. It was when I pushed into my opponent’s base in the game against Nestea that I finally knew I had achieved a reverse all kill. You had a long ZvZ for your first and last games. I was ahead in the first game but wasn’t quite warmed up and couldn’t evaluate the game correctly. I played passively thinking I was behind. Against Nestea, I had no gas after having my third destroyed twice. I used the excess minerals I had to build spine crawlers and decided to turtle. I think this happened to counter what my opponent was doing and resulted in my win. Against Yoda, I chose a build for Terran regardless of who the player was. His hellions didn’t scout my units so I attacked with confidence. Against Happy, I saw a quick third orbital so chose to all-in, Against MVP, I expected mech so got greedy early on and went for a timing afterwards. All my predictions happened to be correct. You scored four kills yesterday, 5 kills today, in total 9 kills in a row. What’s the secret? No secret (laugh). I worked really hard and talked with my teammates a lot. We shared builds and reinforced each other’s weaker aspects. I think I grew a lot as a player thanks to that. You are on fire. How long will this continue? Frankly, I just play the game without thinking about any of this. I think I can always achieve good results as long as I don’t get arrogant after times like this and keep working consistently. Once someone studies me sufficiently, I will lose. Your team faces FXO in Round 2. How do you think that will go? FXO is a strong team but we’ve beaten them in an online teamleague before. I think we’ll take an easy win when we meet again. My team has players who are better than myself and as long as they don’t get nervous, we will do really well. Since you’re doing so well lately, have you changed your goals for GSL and GSTL? I try to prepare for one match at a time without a major goal. Still, my goal for Code S has changed to ro8 from ro16 initially. After ro8, I will try for the finals. 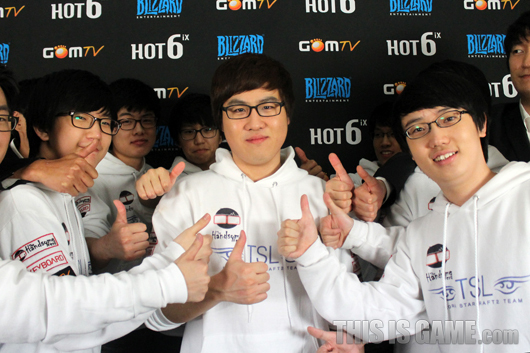 As for GSTL, Round 2 was the goal but since we’ve achieved that already, I want to make the finals. I want to thank the coach who sent me out today showing his faith in me and also my parents who cheer me on from home. My teammates worked so hard for this so getting to Round 2 is fantastic. I hope my teammates don’t get nervous next time and play to their full potential. Poor polt, he's barely on the photo. this means TSL beat FXO at IPTL 2.
what a monster. hohoho they think fxo will be easy pickings, aye? My team has players who are better than myself and as long as they don’t get nervous, we will do really well. And thanks, great work as always storywriter. Was looking forward to this interview. Thanks sw! First time I really focused on Symbol was five or so months ago in the FXO Invitational when he faced DRG in the first round. He beat him down in the first game and even though he lost the next two sets, played amazingly even with DongRaeGu. Now he's turned into a player who can fight toe-to-toe with a player like DRG for the title of best Zerg along with Nestea and others. Always cool when you see an up and coming player that looks as good as the current champions themselves. they've already sent him abroad in the past. he was at MLG winter championships, MLG spring arena 2 and iron squid.